6th ed. A learning guide to the collision regulations where every rule is presented on one page and the interpretations are presented on the face page. Amply illustrated with computer-modelled drawings which give true-to-life views of the situation. 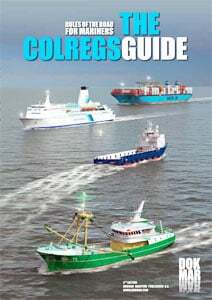 Covers Steering and Sailing Rules, Lights and Shapes, Sound Signals and Exemptions, plus the Annexes. And a plastic sheet with all the lights on it and leaflet with 600 questions. Tags: Staff Picks, Van Dokkum. Combines photos and computerized renditions plus a series of questions makes this a great study guide for all levels of professional training.